Hey, y'all! I'm a twenty-something girl trying to navigate my new life in Glasgow, Scotland. Part delusional Master's student, part traveler, and entirely Southern belle, things around here can get kind of crazy. I'm so glad you stopped by! 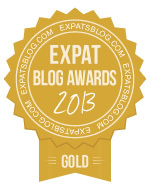 ExpatsBlog.com Expat Blog Awards 2013: Scotland Gold Award! I am an ex-pat, living in France (bolt hole of the Stuarts)? So, why has no-one asked me my opinion or given me a blog-spot? Can it be some fiendish design to keep 'normal' opinion off the air-ways? You may guess ... I am not Scottish (though family folklore claims to have thrown someone on a peat bog fire in Ireland) and thereby hangs another tale - to be Scottish do I need a particular religious affiliation, or not? I have had, and do have, many Scots friends from all walks of life (some even support Elgin City). I do not hold them as potential 'enemies' of the reduced state but I do say - if you want out, get it before I agitate for it!! Count the true cost - oil, defence, jobs etc. Don't listen to the politicians who get rich off your backs especially those from Fettes who made their own killing(s). Independence means just that - no bailout, no return, no 'natural enemy', or friend. By all means continue in your check skirts, even employ Aussies to ride your dark horses, keep your Sporran to excite who-knows-what but above -all REMEMBER. And good luck, whatever the outcome.